There’s nothing quite like a steaming hot plate of the best homemade Southern Buttermilk Pancakes to get the day off to a great start! I’ve been making buttermilk pancakes for years. When we were first married, and for several years after we had kids, I bought packaged mixes. I grew up on pre-made pancake mixes and didn’t know anything better existed. Then, one day I saw a recipe in our local newspaper for Buttermilk Pancakes. I had some buttermilk in my fridge and decided to give the recipe a try. The only question after making pancakes from scratch was WHY? Why did I wait so long to make homemade pancakes?? Southern Buttermilk Pancakes are a simple, pantry-friendly recipe that will make a chef out of even the most inexperienced cook! Want to become the Master of Pancakes? There are a few tricks to making amazing pancakes I’ve learned over the years. Anyone who has made pancakes with me knows I’m a little over the top about following the “pancake rules”. Do not ever mix with a mixer. Southern Buttermilk Pancakes, or any pancake for that matter, are meant to be mixed by hand. Use a wire whisk, or a fork if you don’t have a whisk. Gently turn the batter until the floury lumps disappear. A few small lumps of flour are okay, you just don’t want big patches of flour in the bottom of the mixing bowl. Using a mixer will reduce pancakes that are a big chewy and not quite as light and airy as pancakes mixed by hand. The batter forms little air bubbles when the buttermilk and soda and powder are combined. These same air bubbles for air pockets in your pancakes making them light and fluffy! 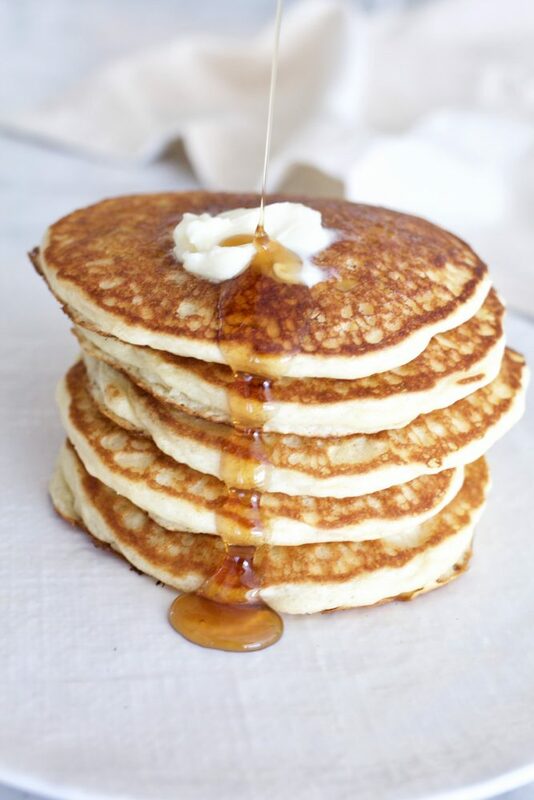 Also, overtaxing the batter will form gluten which gives your pancakes a more chewy, instead of airy texture! Buttermilk. I highly recommend purchasing buttermilk from the dairy section in the grocery store or at your local dairy. Buttermilk will make all the difference in this recipe. You can use a dry mix, but I’m partial to the good old fashioned refrigerated type. If you wonder what you’ll do with all of your leftover buttermilk, I have lots of recipes that will solve your problem! Enter “buttermilk” in the search bar on the homepage of ABK. Butter the griddle. Butter will give your pancakes a beautiful golden finish on the outside and also a bit of delicious butter flavor outside. Get the griddle hot first, I turn it to 350 and then butter. Immediately put the pancakes on the hot griddle. I use a 1/4 measuring cup. If your griddle cooks a little on the hot side, turn it down to 325 degrees. You may also use a skillet on the stove, with the heat turned to medium high. I recommend a non stick surface for either the griddle or a skillet. A good, old fashioned cast iron pan is also recommended. Wait until the pancakes are cooked on the bottom, the air bubbles begin to rise and a few bubbles start to pop. Then, and only then are they ready to turn. Quickly slide the spatula under the pancake and flip. No need to butter the griddle again. If you are adding fresh berries, add after the batter is poured onto the griddle, but before the pancake is flipped! Last tip, actually two tips in one. This involves flipping and smashing. DO NOT turn the pancake more than once. When the bubbles begin to pop, turn the pancake. If you watch the batter carefully, it will rise. That’s what you want, the batter/pancake to rise up. Turning the pancake and overhanding will result in pancakes that are not light and fluffy. While we are talking about fluffy pancakes, I’ll give you my last tip. Never, under any condition, even if the person watching you tells you to do this (personal experience many times), nevereverever pat a pancake down. Promise me. Patting down, is smashing down. All of the air will disappear and you will have a heavy disk, instead of a light, airy pancake. Think about it. It makes sense. Testing to make sure your pancake is done is simple. After flipping, wait for about a minute, or two and quickly poke the center of the pancake with the corner of the spatula. The center of the pancake should spring back quickly after poked. If the griddle is set to 350 degrees, it usually takes about 2-3 minutes per side to cook. That’s it! So simple. I know you’re going to love this recipe. It’s so quick and easy and a recipe you’ll use over and over again. We have been making Southern Buttermilk Pancakes for over 20 years. I occasionally use this mix when we are camping or at our cabin, but for every day cooking, this is my go-to recipe. Pin this recipe, because it’s going to be high on your family request list! There are two sets of ingredients in this recipe. I use both recipes. One calls for more buttermilk, the other calls for less. They are both delicious! Give each a try and let me know what you think! Add buttermilk, eggs and melted butter and mix just until wet and dry ingredients are incorporated. Add milk (or water), a little at a time until batter is still thick, but pourable. Melt a little butter onto the griddle. Using a 1/4 cup measure, scoop batter and place on hot griddle. Cook pancakes until bubbles appear and begin to pop, then flip once. Do not pat down pancakes. Do not flip more than once. -This recipe includes a second set of ingredients. Both are recipes I have used for years, the amounts vary slightly, one recipe uses more buttermilk than the other. They are very similar in yield and final product. Definitely going to try your delicious looking recipe! I like using my cast iron pan for pancakes but want to invest in a griddle. Which one do you recommend? Thanks! I have a built in griddle on my stovetop. 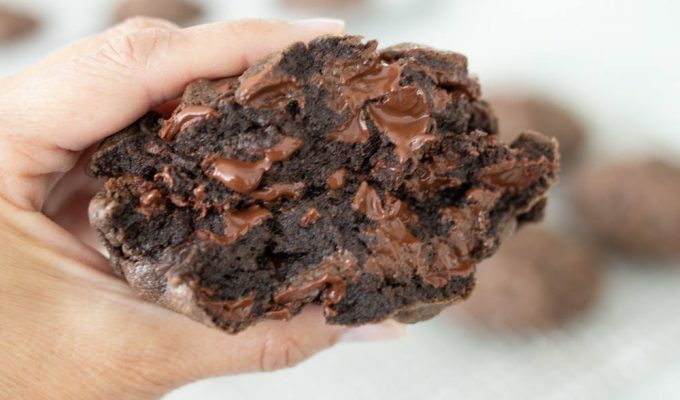 I have used a few different types of electric griddles and like this one that may be purchased in stores or online through Amazon You will love this recipe! These were delicious! I made the buttermilk syrup to go with it and loved it! Thank you! These are perfection!!!!! We also love the buttermilk syrup. These two recipes are the perfect combo. Thanks for your kind comments and thanks for reading ABK! I have been buttering my pan when making pancakes, and the first batch are nice and golden. But the rest are darker and the butter burns. Any tips to avoid this? I read today that oil should be used instead of butter. Thanks!